After online retailer Amazon entered the tablet market towards the end of 2011, it now seems that the firm is going to be launching its own smartphone at some point in 2012, according to the latest rumours. Amazon`s approach to the tablet market is defined by the cut price Kindle Fire, which the company sells almost at costs in the hope that its investment will be recouped after users purchase content using the device. The Kindle Fire, while only available in the US in its first iteration, is set to get a sequel in the next few weeks, with some sources claiming that this will eventually be followed by a standalone Amazon smartphone that will do battle with the iPhone range. The Wall Street Journal reports that the Amazon phone is already being put through its paces in the prototype stage and could be on shelves before Christmas, or at least in the first few months of 2013. It is thought that Amazon will be creating a smartphone with a display measuring somewhere between four and five inches in size, presumably with a high definition resolution. This would put it in the same league as other high end handsets like the Samsung Galaxy S3 or the HTC One X, which feature 4.8 and 4.7 inch displays respectively. It seems certain that Amazon would pick the Google Android operating system for its smartphone after using it for the Kindle Fire tablet. However, it remains unclear which version would make the cut for this handset. The Kindle Fire has a famously overhauled version of Android 2.3 onboard, with a heavily customised interface which puts the emphasis on encouraging users to download books, rent movies and buy applications so that Amazon can make back its money. Android 2.3 was looking long in the tooth even at the time that the Kindle Fire arrived, while Google has recently announced Android 4.1 for smartphones and tablets. This could mean that an Amazon mobile will come equipped with the latest iteration, although past evidence suggests that this may not be the case. While the tablet market is dominated by Apple, the smartphone market is far more competitive and has handsets of all shapes and sizes for people of varied budgets and needs. If Amazon is to take on this sector then it could face an uphill struggle. Of course if it is able to pack high end features, such as the aforementioned large display and a multicore processor solution, into a smartphone which is half the price of similarly specced alternatives, then it will find it easier to make waves. Amazon will also have to strike deals with various mobile network providers in order to get its handsets offered alongside other contract phones. It could of course go it alone and offer the device solely through its own website, which would mean that it will be SIM free but come with an upfront cost for the consumer to bear. 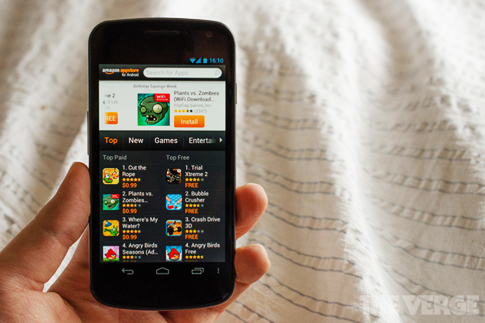 Only time will tell whether Amazon is indeed planning to move into the mobile market.